A program that allows one million pre-approved fliers to cruise through Transportation Security Administration checkpoints is under scrutiny by Congress following a report by federal inspectors that a former terrorist was let through last summer. Specific findings from a report by the Department of Homeland Security (DHS) investigation were either classified or confidential, and therefore reserved for the closed session of Wednesday’s hearing before the House Committee on Homeland Security’s sub-committee on transportation security. In the open portion of the hearing, DHS Inspector General John Roth testified that while the concept of the Pre-Check program is a “positive step towards risk-based security screening,” the agency ought to limit it to “trusted populations.” Roth complained that the TSA “has not accepted the majority of our recommendations” from the report. TSA Chief Risk Officer Ken Fletcher countered that the Pre-Check program was part of the measures the agency adopted to increase efficiency. Between risk-based screening, such as behavior detection, and programs such as Pre-Check, the agency has “significantly increased” its ability to move people through checkpoints while saving $319 million, Fletcher’s prepared statement claimed. On Tuesday, the TSA announced the Pre-Check program had reached a million members. Between that, Global Entry, NEXUS, and SENTRI programs, over 4.6 million people have been registered as “trusted travelers,” enabling them to keep their shoes and belts on, and leave laptops and carry-on approved liquids inside bags at 133 airports around the US. The DHS Inspector General has criticized the TSA’s practice of “managed inclusion,” which sometimes processes travelers through Pre-Check lines in the interest of expediency, citing a case from June 2014, when a convicted felon was processed at Minneapolis-St. Paul International Airport (MSP). Information leaked to the local Fox affiliate identified the person as Sara Jane Olson, 68, who served seven years in prison for terrorism as a former member of the Symbionese Liberation Army (SLA) in the 1970s. She was released on parole in 2009. According to the TSA, letting Olson through expedited screening was not based on “managed inclusion,” but rather a behind-the-scenes program called Secure Flight, which matches passengers with various watch lists. 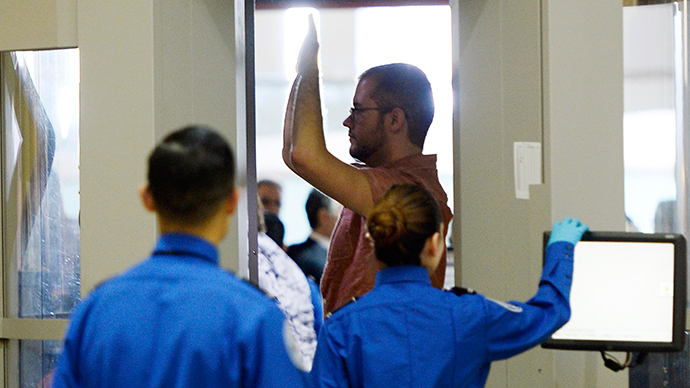 Last week, the American Civil Liberties Union sued the TSA over the “behavior detection program,” claiming the practice was ineffective and leads to racial profiling. “There is no known instance in which these techniques were responsible for apprehending someone who posed a security threat,” says the lawsuit.